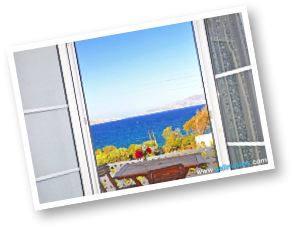 Galini Rooms and Studios, Affordable Accommodation with Sea View in Pollonia, Milos, is a two-floor property located in a privileged spot right behind the Milos Diving Center in Pollonia, Milos, just 30 meters from the beach. Galini features 7 rooms and 3 studios with kitchenettes, some of which with direct view to the sea, and free guest parking on the premises. 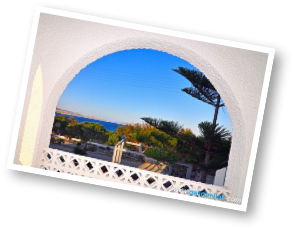 Galini Milos is an ideal choice for vacation in Pollonia, Milos, as guests can simply walk 30m. to the Milos Diving Center and the beach, 100m. to the Pollonia village center, the mini-market, the bakery, the kids' playground, the bus stop and the taverns, 150m. to the Pollonia main beach, and 150m. to Pollonia's third beach, just south of the property, including the Yabanaki beach bar. The Galini Rooms and Studios property is 10km. away from the seaport of Adamas and 13km. from Milos Airport. Galini Rooms and Studios feature daily maid service/cleaning, while the change of linen takes place every 3 days. To inquire about availability or make a reservation please fill out the reservations form. Photography and Web Design © 2012-2019 Andreas Belivanakis. All Rights Reserved.